The European Telecommunications Standards Institute (ETSI) has finally settled on a design for the new nano-SIM format — officially known as the fourth form factor (4FF) — after weeks of heated debate between the major mobile manufacturers. The new design is 40% smaller than the current micro-SIM format, at 12.3 millimeters wide by 8.8 mm tall by 0.67 mm thick, allowing smartphone vendors to build even slimmer devices. 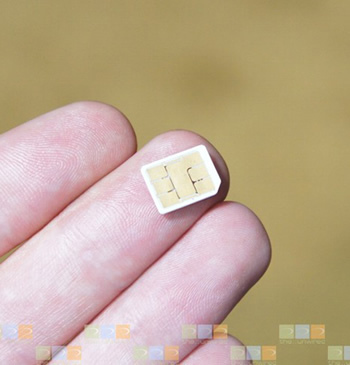 ETSI says the nano-SIM standard will offer the same functionality of all current SIM cards, and can be packaged and distributed in a way that is backwards compatible with existing SIM card designs. The group didn’t reveal which format was chosen in the end, saying that “it is no longer a question of one company or another, the industry has collectively made a decision.” Nevertheless several reports have noted that the dimensions listed by the institute match those of Apple's proposal. Motorola, Nokia, and RIM all opposed the design put forward by Apple, even though the latter pledged royalty-free licensing if selected. They argued that their design was technically superior and less likely to cause handset damage when inserted, plus it didn’t require a special tray like Apple’s. All sides were unable to reach an agreeable consensus on the matter and the debate turned sour by the end of March when RIM accused the Cupertino-based iPhone maker of cheating to get its own version of the standard approved. But earlier this month, RIM teamed up with Motorola to meet Apple halfway with a design that slightly tweaked firm’s original proposal by adding a notch on one edge to secure the card in place when inserted. It's unclear if ETSI finally decided to go with this design or of it’s all Apple.